Mon came home angry yesterday. She barely even wanted to cuddle. I gave her some nose kisses though and that seemed to help a little bit. She says it's that work thing. See, she really should stay home with me. Maybe I'll be able to win that argument soon. I made sure to stay cuddled up to Mom all night. Dad was doing ok, but Mom needed me. I must have done a good job, she's feeling a little better now. I'll make sure to be ready to nose kiss her when she comes home from work today too. Just in case she needs it again. I've got to be prepared you know! Until then, here's a snow face picture of me I'm sure you've all been wanting to see. Sniff ya later! Mom and Dad sing at me sometimes you know. They make up a lot of songs using tuns they hear on the radio, or CD. Mom's favorite is "I'm being followed by a Pei Shadow" song to the song "I'm being followed by a Moon Shadow" by Cat Stevens. Woah, wait, someone named their child CAT? Is there someone named Dog out there? 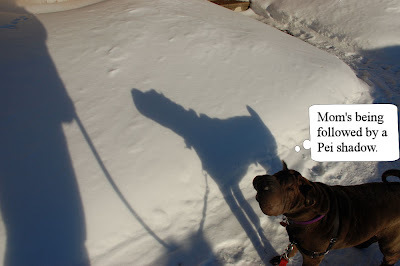 Anyway, here's Mom being followed by a Pei Shadow. Pei laughter. Maybe I'll make this a regular feature and write stuff down when they sing at me. We had a LOT more snow yesterday. So much so that I was starting to worry about Mommy. It took her over an HOUR to get home, a drive of 15 kilometers. Then we she came home I was SO excited I needed to pee. You know how it is. So Mommy opened the door and I had NO STEPS to go down into my backyard. I knew they were there though so I hesitantly stepped down to where I knew the first step was, then the second and WHOMP! Up to my boy bits in snow. WAH! It's hard to pee when your boy bits are in the snow you know. So I got myself up the apparently non-existant stairs and peed. Let me tell you I did NOT want to go back out again later, but I needed to because when you have to pee, you HAVE to PEE! Here's a picture Mom took of me Tuesday. It's hard to believe it was so sunny Tuesday and yucky and snowy and I didn't want to go out yesterday. It's a little too early to tell how it's going to be today, but Mom says COLD. I think I'll stay inside with a warm blanket. Mom and I had SO much fun yesterday. We did laundry, we played video games, we ate cookies, we had a short nap, I got loads of chin scratches. I missed my morning nap we were so busy. I did get my afternoon one though. I mean, dog forbid I not get at least one nap during the day! We even took the camera for a walk! It wasn't so cold outside Mom said it was safe for all of us to be out together. So we finally have a few outside shots of me on snow. Mom says it looks like I'm on a white screen, but hey, what can you do. Look for those pictures later in the week since we're not sure when Mom will get to photograph me again in the daylight snow because of this silly work thing. I don't know if I like this work thing. She says it's to keep me in cookies and kibble. But you know, Grandma and Grandad have been getting me cookies, and Daddy gets me kibble most of the time, so you know, she might not be doing this just for me. Would I rather she be here to cuddle me all day or get more cookies? Tough decision. Well, no, not really. I'd rather she be here. A cookie lasts a short time, but cuddles are forever. I felt the urge to sing this morning. That's what she said when she cuddled me awake this morning. You can't lie to a puppy when you're cuddling him awake. That's a law, like that murphy thing that causes food to fall from the skies for us . OK, so I have to figure out what Mom and I should do today. I think some SERIOUS ear scratches and tummy rubs are in order. And then chin scratches. Oh yeah, chin scratches. Maybe she'll nap with me! Oh this is going to be a wonderful day! OH YEAH! And I'm back FINALLY with a Monday Morning Report! I even have things TO report. I'm feeling good about that. First of all, that picture of me is not facing the wrong way, Mom was taking the picture from underneath me. That's the bedroom door you can see in the background. OK, lets get started with the report! Saturday was a little cuddly. Which is ok, but it also involved ear cleaning. BLECH! I'm guessing there is more ear cleaning in my future since Mom and Dad are making disgusting noises when they pull stuff out. Sigh. Mom thinks I should recite the Mantra: Surolan is my friend. Yeah right Mom. Think again. Sunday started out pretty dull, I napped, but then it got exciting. Auntie Brenda came over! We had a good snuffle together. I think she needed it. Then there was the ADVENTURE to rescue Daddy from work! Always fun. There was a lot of salt on the ground at Daddy's work place so I didn't get a chance to walk outside and check my pee-mail. Darn it. I had something to say too. Wait, don't get discouraged, Mommy and Daddy brought me to a REALLY nice smelling place (a Feed and Seed place) where I was worshipped and given cookies. I got to sniff a few people and was on my best behaviour and when I jumped up to do some counter surfing I got a cookie! Mom says I also added drool to all the papers on the counter. I was too busy eating to comment. You shouldn't talk with your mouth full you know. I thought that would be it for the Adventures for Sunday, so I curled up right behind Daddy's computer chair so he could easily give me scratches and then I heard the word again, FJORD! A ride in the car later and we were at the ice cream place! Mom and Dad are so wierd. It's minus 20 outside and they go buy ice cream. Dad was even in his shorts and sandals. Somedays I wonder if I want to be seen with them. By the time we got home I was exhaustipeited! It was so nice to get out though. I was starting to feel a little isolated from the world because it's been so cold around here and Mom and Dad don't want me out too long of I'd freeze my wrinkles off. 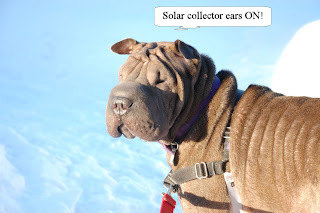 I do appreciate them for that, but sometimes a Pei has to go Adventureing. This Pei can't live on cuddles alone you know! OK, I feel better having written some. 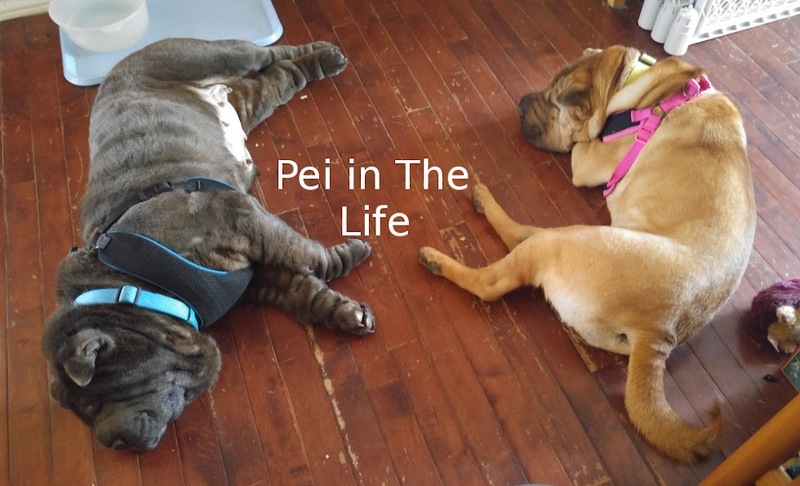 Pei -Ess. Mom and I are playing with the colour scheme. Don't worry, we'll settle it soon. Saturday is for snuggling. So why are my pawrents not cuddling me? Mom's in the shower because she has to go to work and Dad is on the computer. He said he'll be staying home with me today. OK, but we'd better cuddle because I'm feeling deprived. There haven't been any good adventures lately, I'm going into withdrawl! Even my blog posts are suffering. I'm still checking my friends blogs though. That keeps me going. Thank dog you're all here. Look at how early I'm posting. 2:27 AM. That's in the MORNING. Daddy just woke me up to steal his blanket back from me. Why am I always the one who has to give up the blankie? Sigh. And we had such a nice time during the day all cuddled together. I did get chin scratches and ear scratches and kisses out of it, but I feel that's a bribe. Sigh. Hang on, checking to see what he's doing now...........OK, he's apparently settled down. Now I have to go and make myself a comfy spot again. SHEESH! He's back, and then he's gone again. So, those of you who were worried for my Dad the other day, he did come back. Then he left again yesterday morning and came home when Mommy was asleep last night. I don't understand why he couldn't spend the whole day with ME. He really needs to adjust his priorities. Love you anyway Dad! So yesterday was a nice adventure at DAY CAMP! The ladies there love me. Here's what they had to write for Mom. "Bolo was such a good boy today (not news, but good for Mom to know). He was quite happy to have the girls taking turns snuggling him (I live a really hard life, pei laughter) and I'm sure if he could speak he would have demanded more!!" What's this -IF- I could speak, I -CAN- speak and I DID demand more. I made sure to get a few more cuddles before leaving the hotel to take Mommy home too. Mom says I should get the ladies at the Pets Hotel a nice Valentines card. I LIKE that plan! Maybe my photographer cand get busy on that, right MOM? 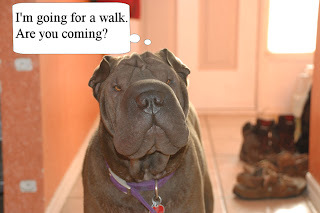 Pei-Ess, Daddy is staying home with me today! Just had to write that. Excuse me, I have to go cuddle him! So Dad comes home from work today and I am SO glad to see him. Only partly because I'm busting for a pee. He lets me out to pee, and then we cuddle and I investigate things and you know, the usual. Then Mommy comes home and I greet her at the door and she sends me out to pee, mostly because I asked her to. We cuddle and I tell her all about my day yada yada yada and then all of a sudden Daddy is gone. Uh Hello? Where'd you go? I check Mommy's pockets and he's not in there. I hope he comes back. If not, does that mean I get his side of the bed? Oh, wait, if he's not in it, I can't steal it from him. Hmmm. Daddy! Come home soon! I miss you! I want to say thank you to Nibblestreats, they gave me an award. I've only just met them, but thank you guys! I'm not good at passing these on though, I can't pick just a FEW people. 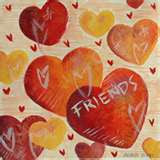 I want to include everyone. So, if you don't have this one yet, grab it! That's about all I wanted to say. I hope I have a more interesting week. This one hasn't had enough cuddles OR blogfodder. Mom was supposed to be helping me with my blog, but she's on the phone with Miss Jenn. Miss Jenn though agrees that I haven't been getting enough cuddles. Thank you Miss Jenn. Snuffles to you. Today has been really nice though. I helped Mommy finish one book this morning by sitting next to her on the couch. It helps her read better she says. OK, I won't complain. Then this afternoon she was laying in bed reading, so I, of course, was snuggled up against her leg hoping she'd nap. I'm her napping buddy you know. Mom also took a whole bunch of pictures of me. This one is along the length of my body. Do I look fat? Mom says the black half circle is her lens. It's too long for her flash. She needs to charge the batteries for the big flash apparently. OK, whatever. Mom got some great pictures of me though. I'll showcase them throughout the week. I have to head back for more cuddles, Mom's off the phone..
Well, not THAT busy, but Mom's back hurts a lot so I've been trying to cuddle it back to normal. She's says I'm doing a great job! Today I had to sit on her foot and rub my ears into her knee for almost a whole hour before either of us felt better. Pei laughter. In other news, Dad took me out for a walk this morning and I took only a few steps and said I don't think so! It's too cold for little peis. Mom said it was -39 with the windchill. Mom also says that at -40 Fahrenheit and Celsius meet so I don't need to translate -39 into Fahrenheit for you. Dad said I'm going to need to start wearing my booties. Grrr. Oh! Is it time to cuddle Mom again? Gotta go. Pei-Ess Daddy has a blog now too. He's writing film reviews right now, and he uses what I've heard are called HBO words. Just a warning. You can visit him here. 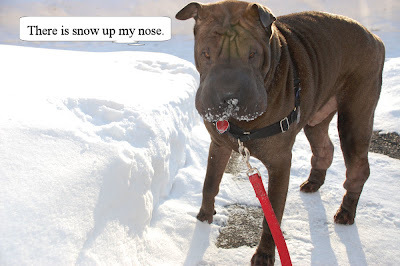 Mom is tired of the snow so she vetoed my snow picture for today and went back into the photo archives to July. You know, I look pretty good even without snow. Pei laughter. I had a nice time at Day Care yesterday. I got super mondo huggles! The ladies there love me. Mom thought it was very funny that when we walked in everyone went Hi Bolo, Hi Bolo, Hi Bolo. Except for the Man, Dave was his name. Mom thinks he's the one who brought me to the vet the second time I had to go because I got in a fight. I woofed at him. Mom says I'm a ladies man. But c'mon! I KNOW all the ladies at PetSmart now. Then all come down to my level so I can snuffle at them. So what are my plans for today? Nothing. Absolutely nothing. Where's my social secretary!?!? I need some Adventures! MOM! So I'm feeling a bit better. I spent Sunday curled up just within arms reach of Daddy while he worked on a puzzle. Every now and then he'd reach back and cuddle me. Life is good. My face isn't swollen anymore, the owie on my foot doesn't hurt anymore, though it's still a little red, and I get to go to Day Camp today! Whee! Last time they worte on my report card I love(heart) Bolo! Why wouldn't I want to go back to that. Pei laughter. So what's this Giant Kong nonsense I wrote in the title? Well, everyone knows I have my own pee-mail address right? So Mom and I were looking through this message that got caught in the Spam Filter, I thought Spam was meat. Can you filter stuff through meat? The title of the pee-mail was Get a Giant King-Kong. Ooooo. I told Mommy to stop because I wanted to check that one out. She goes, Bolo, they're not talking about Kongs like the one I bought you that you never play with. Really? says I, Then what are they talking about? Mom says Dangley bits. I snorted and said That's false advertising! She totally agreed with me. I was all hyped up to have a contest for something else and have the Kong as a prise too. Sigh. Oh well. Doesn't matter I guess, I'm going to Day Care! So, uhm, things didn't work out as planned yesterday. I did get quite a number of cuddles, but not enough to head off another allergic reaction to something. 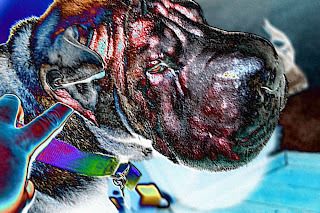 Mom and Dad noticed my face going red at about 10:00 yesterday morning and a call was placed to the V-E-T. No, I didn't have to go in. Mom just checked to see if I could take Benadryl with my antibiotic and apparently I could. Darn it. I hate taking pills. Anywhere you see red on my face/nose, that's where I was itchy. Yeah, pretty nasty eh? Yeah, same thing happened yesterday. So down goes the Benadryl and Mommy sprays me with the same stuff she sprayed me with last time. (Baking Soda and Water.) I hate getting sprayed. Needless to say with Mommy doing all these thigns to me, she did NOT get a lot of cuddles. Then last night before going to bed, Daddy rinsed me with water. That takes place in a BATH for those of you not in the know. So I decided to barf on Mommy's pillow. She was too quick for me and I ended up barfing in the barf bucket. Sigh. I hope I feel better today. So it looks like it could be something in my cookies. Sigh. So I won't be getting any for a while. Whimper. I'll keep you all updated on how I'm doing ok? Sorry about that, I needed to take a little break, and Mom is out of Bolo pictures. How can you be out of new Bolo pictures you ask? It's because Mommy started a new job and she's not spending as much time being my main media team. She has today off though and she said we could cuddle - I think she's feeling cuddle deprived - and we need to take pictures for my fan club! So it looks like I'll be busy, but I wanted to take a minute to let you all know I'm doing great! My owie is almost gone! And we changed my header. What do you think? OK, I'm off to cuddle my poor cuddle deprived Mom. 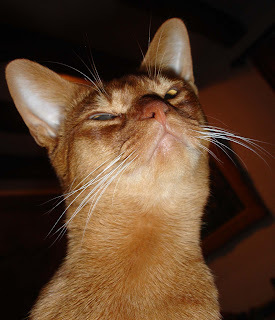 I counted, I've been bloggin for more than 2 months straight what with the Nosevember contest, and then Peivent and the 12 Peis of Christmas. PHEW! I'm a busy guy! Thank you everyone who wished my Grandad a Happy Birthday yesterday, I'm sure he got a warm fuzzy - even though I wasn't there Pei laughter - because all of you were thinking about him. Sorry there isn't a picture today, I went to DAY CARE! I think it was a spontaneous Day Care session, because I didn't hear Mommy make a phone call yesterday, and normally I do. But Daddy left the house this morning and Mommy was getting her boots on and I was still downstairs, not upstairs with my bone. So you KNOW something interesting was happening. Then Mommy started packing my Lunchbox and I got excited. I want to say hi to all the lovely ladies at the PetsHotel! They gave me extra cuddles because I sent them such a nice Christmas Card. It was a ncie Christmas Card wasn't it? I was very pleased with it. OH! While we're on the subject, a HUGE Thank You to everyone who sent me a card (snail and e-mail). Granpaw was SO impressed with them. Apparently he has a contest with his brothers over who gets the most cards and I won. I didn't even know I had been entered! Pei laughter. OK, Mommy is home early from work, I'd better cuddle her. Twelve! And a Special Message! and a Nose Kiss just for you! I hope everyone has a great Twelveth Day of Peimas! Nose kisses to everyone. Thank you Dad for helping me with my song. Nose kisses for you too! And now a word to one of my greatest supporters. He has NOTHING to do with the Twelve flaps of skin, ok, Grandad is special all on his own. Can't say there's anything else interesting. 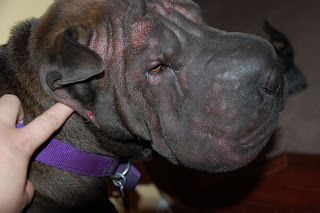 My owie seems to be getting better but I have a bad itch on my head. If it's not one thing it's another. Mom muttered something about getting me an allergy test. I don't know about that. It doesn't sound like a whole bunch of fun. And I'm betting it doesn't involve cookies AT ALL. Isn't that a beautiful sight? Mommy finally refilled my cookie jar! Or course, I had to taste test. Quality control is everything you know. Yummmmm. Anything else you need me to test? Oh before Mommy puts away all the Christmas stuff, look at the lovely gift Aunt Sharon got her. Did you ever see such beautiful Christmas Ornaments? I knew the tree needed more Shar Peis on it. Pei laughter. And lastly, here's my owie. It's a bit graphic, so if you don't want to look, that's ok. It's shrunk a bit Mom says. I think so too. Oh shoot, Mom just remember I haven't had my antibiotic. Hmm, it's ok, she's been giving me cookies with it. Can't be all that bad if it comes with cookies can it? Hmmm, maybe I should have said Nine destuffed snowmen. This was a stuffie Aunt Sharon and Uncle Marty got my fro Christmas. If you want to see me destuff it, look at this post here I think a few people may have missed it because it was during the "holidays". It's my first video appearance though so I need to plug it again. Pei laughter. My owie is getting better. Thank you Doctor Ives for taking such good care of me. Cyber nose kisses to you. And thank you Mom and Dad for taking care of me too. Do you think maybe there could be a few more cuddles and ear scratches though? Pei giggles. Eight days, one of them sad. It's been a rough day here. My owie still hurts. I DID end up at the V-E-T. Doctor Ives was really nice though but she did prick my owie to see if it was pus filled, which it is NOT. So I have some antibiotics to help get rid of it. I'm staying really close to Mom and Dad so they can comfort me. Not just because of my owie either. My buddy Sen-Chan at The Pouponette crossed the bridge today. I'm going to miss the little guy. He always had such great adventures. Tom, Tama-chan, #1, we're all thinking about you at our house. 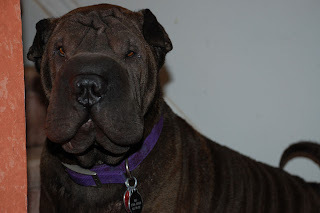 Pei snuffles for you. It's a little tender and Mom mentioned the V-E-T word. Uhm, do I have to? Uh uh. Dad mentioned the B-A-T-H word. How come I lose either way? Sigh. 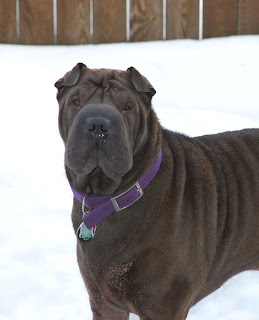 I need to send out best Shar Pei wishes to everyone for a safe healthy and happy New Year full of hugs, cuddles and nose kisses. And a very special Happy Birthday to my Uncle Marty! Cyber Nose Kisses to you Uncle Marty!